Our smart phone to many of us is our best friend and thus depend heavily on it to facilitate in running our day-to-day activities. The primary function of every phone is to make calls and keep in touch with our loved ours, friends and business partners, but over the cause of time we look for more convenient ways to interact with our smartphone and gadgets. Today i will be talking about an android app that allows users to control their android device by tracking their facial movements. 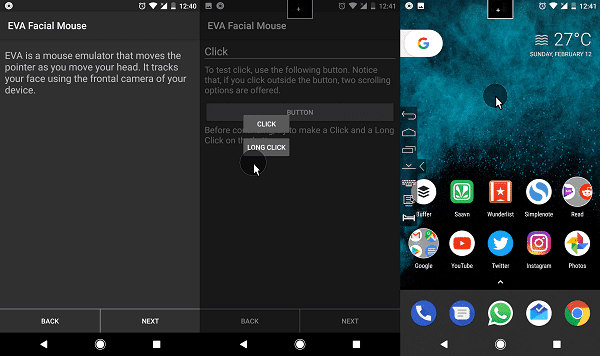 The app which goes by the name "EVA Facial Mouse" is helps in turning the users head into a virtual pointer and overlays the display with some nifty utilities for double-clicking, clicking, scrolling and more. This app could be used for fun and ease according to how the user wants it, but the developer of the app says that app was made primarily to aid people with varying disabilities. People who suffer from amputations, cerebral palsy, spinal cord injury, multiple sclerosis or amyotrophic lateral sclerosis would be able to operate their phones via the functionality of this app. Once setup, your screen will have a new toolbar on the left containing crucial actions such as back, home, overview, reveal the keyboard, options, and more. To click an icon, you will jsut have to hover the pointer over it for a second the app will be tapped automatically. However, to configure its core settings, you will need to go to settings and grant it accessibility access. Some functionalities on this app might not work well -- such as games, navigation might be restricted to a few basic features and it might not be used simultaneously along with other apps that uses the camera. EVA is also an open source and can be found on GitHub.